Awesome! She looks like Legends material... Hope she wins. Komaki's design has "Moe cliche" written all over it. As always, Inafune does the best designs. But if Suetsugu's design wins, at least the character will be one of the more unique females in the MMU. Too bad Komaki's design would fit in a Starforce game better. Oh well. The waifu wars thing was a bad idea in the first place, because there will be a lot of butthurt and whining down the road because of this. Goddammit Jap people! Komaki's design is horrible, they probably like her just because it's cutesy and stuff. I ended up voting for Hideki Ishikawa's design. It's easily my favorite and she's very different from any other Legends character. And since she's a spotter the dress doesn't inhibit her. And I think overall she is my choice for the personality described. I'm a little disappointed she's so far behind, but I don't mind either of the two in the running winning. Hey, at least there'll be a lot of fan fiction and fan art off of all of the designs that don't win. Like other people have said in the Unity forums, it would be good to have a second round of voting featuring the top 3 girls from this poll, with more artwork from the designers. So... I voted on both the English and Japanese polls... Am I doing it right? Also, voted for Sensei's design. I guess every person has is own idea of what's fitting into Legends... Which is why Capcom shouldn't have done this in the first place. I said that before, I'll say that again, half of those designs, are oversexualized young moe cliches or whatever. Ishikawa, namely, is a young girl with Tifa-sized breasts. What the hell. At least Komaki's design has any sense of decency, but clothes are out of DASH's world. At the end of the day a character design is something silly to get into serious arguments about. Unless it ends up affecting her actual personality. But we've had a (rather limited) description of her character and it seems to be the same regardless of the results of this poll. Still I'm surprised Capcom means to give the fans even this much input. IMO, Komaki's design fits Legends the best, but that's just because if you painted her outfit red, and dyed her hair, she could be a alternate style of Roll. Japan votes the moe option and you people are complaining? That's like yelling at a dog to stop being a dog, it ain't gonna happen. Heh, sweet, I voted for her. Yea, I think she fits in best. The other one I liked was Higurashi-san's. I think people here don't know what moe is. If any design there would be considered moe, it would have to be Nakayama's design. All of the designs I do like, but Komaki's design best fits the DASH and the heroin concepts we are looking for. 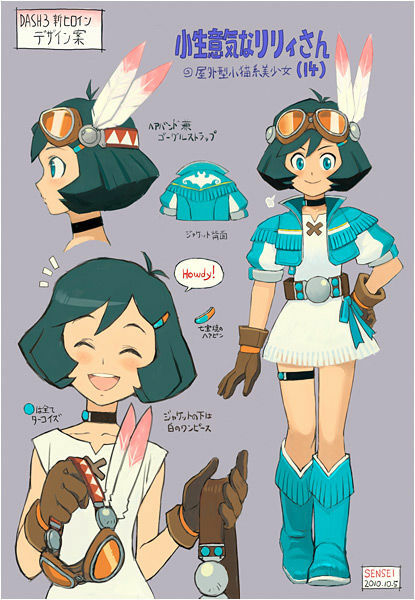 Sensei's design is interestng and does sorta remind me of Tomahawkman and Dingo from EXE, but I guess in that case Komaki's looks kinda like Misora as well. Then we have a more original design by one of my favorite designers for all his other works(Yoshikawa), but that looks more like something from Nausica rather than DASH. Higurashi's has a DASH concept, but not really a heroin concept. The rest of the designs seem to be a big far from the DASH style as well. I was just wondering.. Why is an indian girl saying howdy? I think the designs of Sensei, Yoshikawa and Higurashi fit better the DASH style. If his design got chosen, I will BUY 3DS and RD3 for sure. His design is flawless and unique. We never had a bluish green hair color heroine in Rockman series, I believe?